The nineteenth century French poet, Arthur Rimbaud (1854-1891) and the French Post-Impressionist painter, Paul Cézanne (1839–1906) both had an enduring influence on Sidney Nolan and his art. This drawing is from Nolan’s Rimbaud/Cézanne series, named after these two influential artists, and it is one of 50 art works from this series in the Nolan Collection. Inspired by the intense imagery of Rimbaud’s poems and the expressive vitality Cézanne’s drawings in particular, Nolan worked rapidly on this series which he completed in just six months. This drawing depicts an artist at work in front of his easel. It is one of the few works in this series that centres on a single figure, and it is comparatively more ordered and structured in its compositional arrangement. This drawing could be a self-portrait, or it might be viewed more critically as a caricature, parodying the artist. 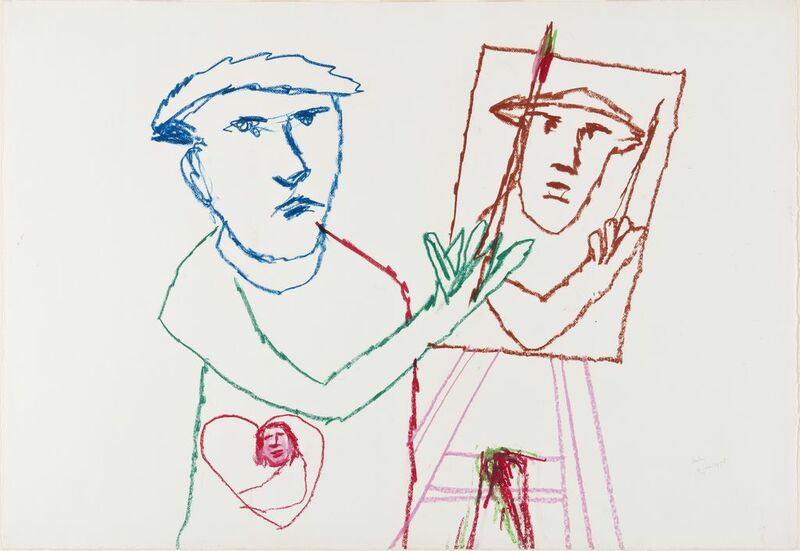 In front of his canvas, the artist poses, brush in hand, sporting a beret, and he wears his heart on his sleeve. Who is the woman in his heart-shaped pocket – his muse or his alter-ego?